I was scrolling through my phone this morning, and lo and behold, one year ago I was visiting my mom, and we were testing the last leg of recipes for the cookbook, including this doughnut recipe. At this point last year I was so close to being done my manuscript I could taste it, and yet had about 20 recipes to go. A bit of bakers fatigue was setting in, as I suppose it would after going hard for 4 months, testing/baking about 8 recipes a week. 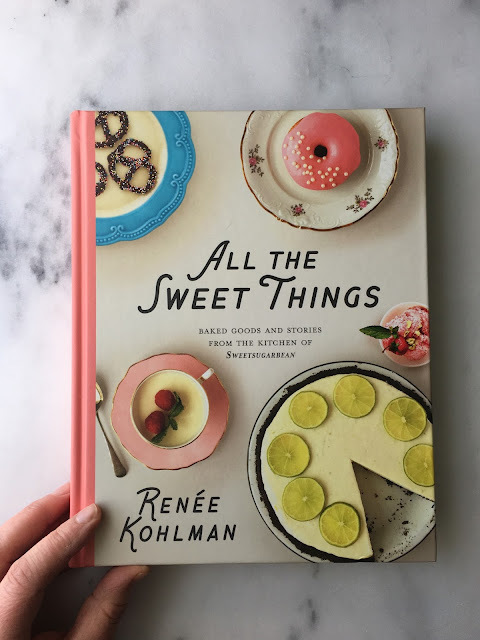 Flash forward to one year later, right here, right now, and I'm so happy to hold my very own copy of All the Sweet Things. It arrived in my mailbox on Valentine's Day. Fitting, as I put all of my heart into this project. To finally hold everything I've worked so hard on, well, it's an indescribable feeling, but something along the lines of joyous and awesome and freaking fantastic comes to mind. I didn't tear into the parcel as one might think I would. I know. Who is this girl and where did her self control come from? Instead, I waited until after my guy and I had our Valentine's date (pizza, movie), then we came home and I made tea. 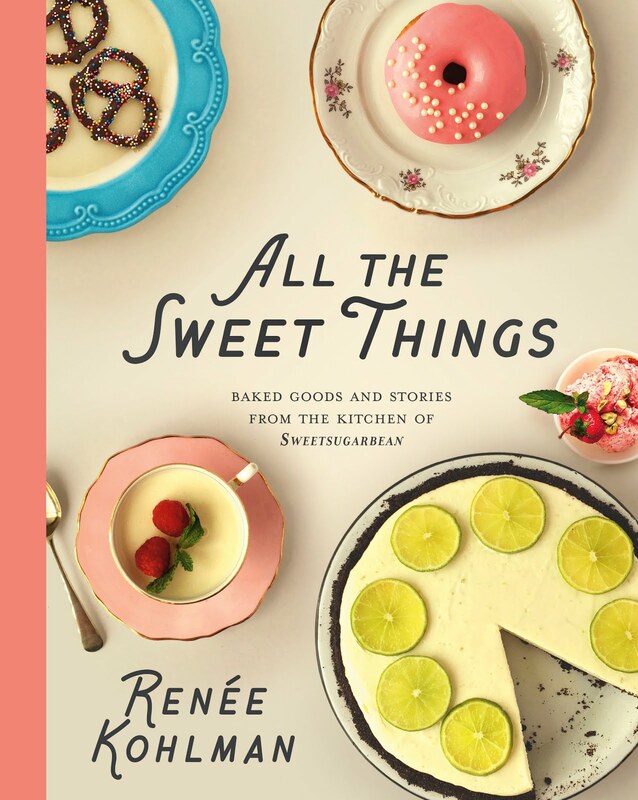 Nestled on the couch, I opened up the package carefully, and then I lifted my cookbook out of the envelope. My book. My baby. It's beautiful. And heavy! 313 pages heavy. I opened the hardcover and fell in love instantly with the pages. Gave it a good sniff, too. Aw, fresh book smell. I leafed through the pages, reading out passages of headnotes, and a few essays. We laughed and cried, sometimes simultaneously like a couple of dorks. It was a great night. One I'll never forget. And I'm so glad I had my lovely man to share it with. He's so proud, and my biggest champion. Last year, he wasn't around as I was powering through the manuscript and recipe testing. I could barely remember to feed the cats, let alone nurture a relationship. But, life has a funny way of working out, and I'm so glad he's with me as we enter the final (sell all the books!) phase of this process. So, there are five, count them five, doughnut recipes in the cookbook. French Honey Crullers. Maple Bacon Long Johns. Baked Cake Doughnuts with Chocolate Glaze. Chocolate Baked Doughnuts with Raspberry Glaze. 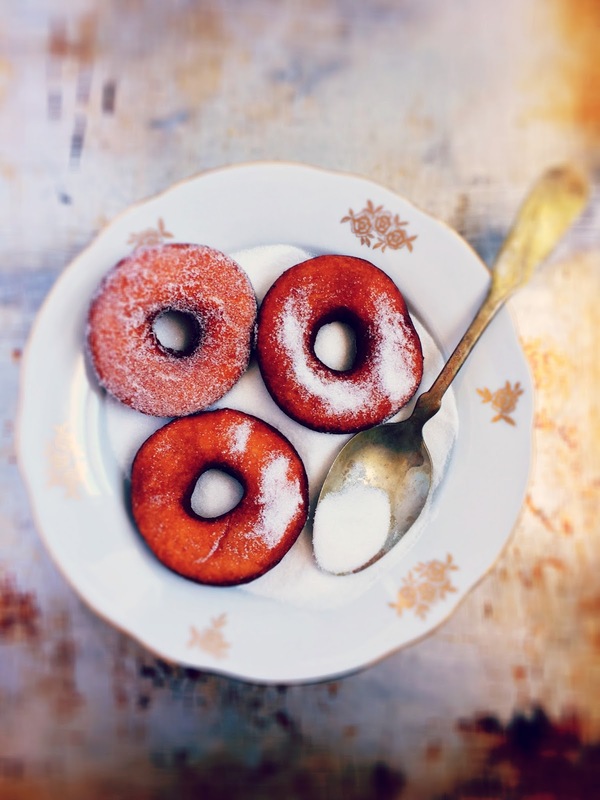 And these, the classic, Sugar-Coated Cake Doughnuts. I'm in love with them all, and I can't wait for you to try them! Can't lie, those recipes were really, really fun to test and photograph. The Sugar-Coated Cake Doughnuts made an appearance 4 years ago on the blog (how life does get better!) but I thought it would be good to share them again, as they are just so simple and delicious. 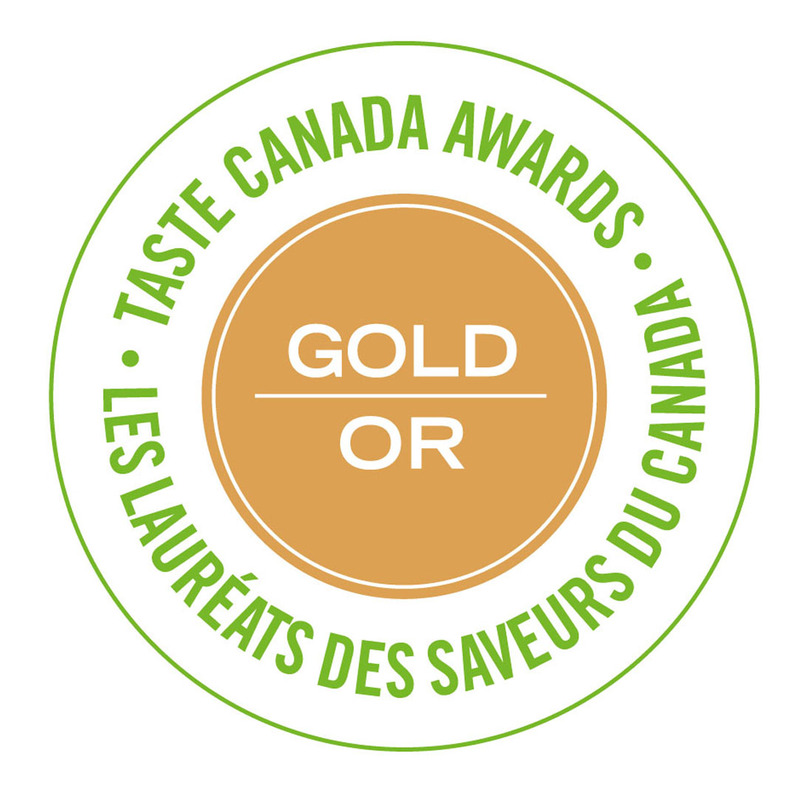 I'm going to be sharing more recipes over the next 2 months as we gear up to release date on April 25th. How very exciting and freaky and awesome. If you haven't preordered yet, all of the info is in the My Cookbook link above. If you have preordered, thank you so very, very much. I wish I could give you all doughnuts, but instead you have my love and gratitude. Makes about 2 dozen doughnuts. Line two baking sheets with a few layers of paper towel. In a large bowl, beat the eggs slightly and mix in the sugar. Beat in the milk, cream and vanilla. In a separate bowl, stir together 1 cup of flour, baking powder, salt and nutmeg. Add the flour mixture to the egg mixture and stir together. Add enough additional flour 1 cup at a time to make a soft dough. Divide the dough into three sections. Pat each section of dough gently onto a lightly floured work surface and roll until about ¼ -inch thick. Use a doughnut cutter to cut the dough into doughnut shapes. Repeat with the remaining dough. In a large roasting pan with high sides, pour in the oil and heat over medium-high on the stove top until the temperature reaches 370°F, or until a piece of dough is dropped in and it turns golden. Fry the doughnuts five at a time until they are golden on both sides, about 2 ½ minutes in total. Using tongs, turn them frequently in the oil to ensure both sides are browned evenly. Carefully remove the doughnuts and place them on the prepared baking sheets. Place the granulated sugar in a shallow bowl. 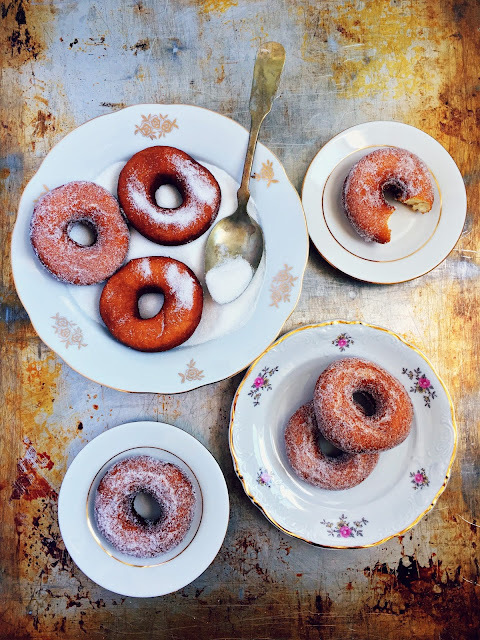 While all of the doughnuts are still warm, toss the ones you want to eat in granulated sugar. If you are freezing any, skip the sugar coating for now. They freeze really well in an airtight container for 1 month - just thaw, warm slightly and toss in sugar. The doughnuts tossed in sugar keep well for 1 day in an airtight container. Note: Don’t forget those little doughnut holes! My mom always fries them first, then tosses them in sugar. They only take a minute to cook and are a treat for the little (and big) people awaiting the real thing. Any irregular pieces of dough leftover from cutting can also be fried until they are golden brown. Note: Yes, you can use your roasting pan that would normally contain a turkey! If not, a Dutch oven will do, though you won’t be able to fry as many doughnuts at one time. Note: If you don’t have a doughnut cutter, use 2 different sized cookie cutters, (approximately 3-inches in diameter and 1-inch in diameter, respectively) to cut the doughnuts and holes.